Sean P. Sullivan - Washington Wine Report: What is Washington’s signature grape? You decide! And that’s not even a remotely complete list of all the varieties grown here. While many regions of the wine world are defined by a single grape variety or style of wine, Washington is not and may well never be. It lacks a 'signature grape' - one variety that defines the state the way, say, Pinot Noir defines Oregon to the south. It creates some interesting challenges in establishing the state’s identity as a wine region around the country and world, but let’s not forget that these are still early days here. So what is or will be the grape that comes to define Washington in the years to come? Here’s your chance to weigh in. Vote in the poll on the right and/or leave a comment below about what you think Washington’s signature grape is and why – or why not. Is it important for the state to be identified by a single variety or is Washington’s diversity a strength? You tell me. In the poll, I’ve included four of the ‘Big Five’ grapes – Cabernet Sauvignon, Merlot, Syrah, and Riesling, omitting Chardonnay because, well, it’s not going to happen. I’ve also thrown in some grapes that more (Tempranillo) or less (Malbec) recently have generated buzz as well as some other grapes and categories bandied about. Did I miss your favorite grape variety? Leave a comment below. 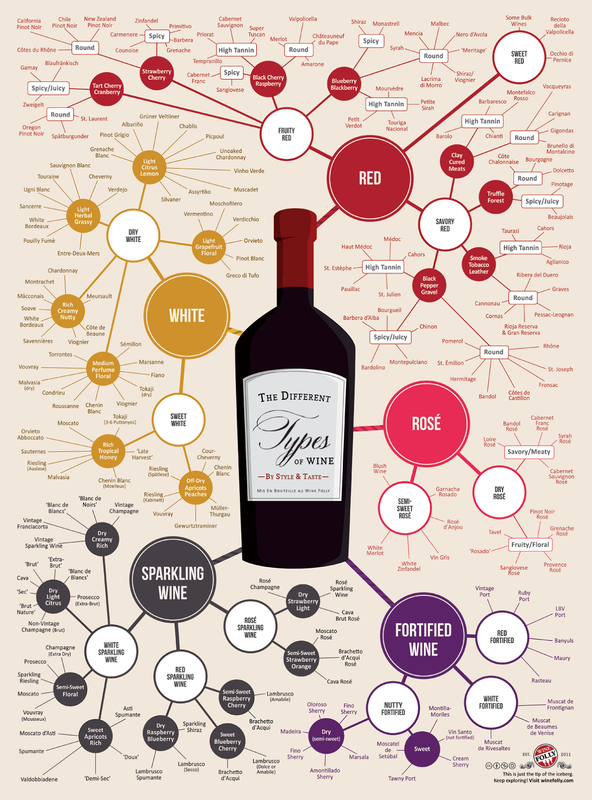 Graphic above courtesy of Wine Folly. See the original post here. I have made wine from Washington grapes, mostly Cabernet Sauvignon, Syrah, Merlot, and Lemberger, for over 20 years. The different AVA's within the region all seem to have their particular "signature" varietal. I personally feel that Cabernet Sauvignon from Horse Heaven Hills (Champoux Vineyard to be exact) is the best pure varietal wine I have ever made. Syrah is my go-to Washington Wine, but I love the Cabs as well! Cab Franc is fast becoming an obsession of mine as well! You are going to force me to pick one? Syrah. Isn't the soil well suited to Syrah on the east side of the state? I always thought Syrah was the Washington signature grape. Syrah. But we produce a mean Malbec as well, and Tempranillo in the right hands is deeelish. But I'm sticking with Syrah. Syrah and Riesling. I like Cab Franc, but not really as a signature. The marketplace says that Riesling Rules, which is great because we make so much Riesling and so much excellent Riesling but also a shame because it leaves out so many of our best wines. I think the quest to name a signature variety for Washington is a dead end road. There have to be better ways to communicate our wine identity. Just had a locally grown and produced Albarino, best one I have tasted in the US. (I am a fan of this grape). This is a grape to watch as more of it is planted in WA St. Otherwise, I would say a Riesling. While I love many of the grapes mentioned I think Wa. produces the best Merlot on the planet...bigger and more robust. For a white..I think Riesling would certainly be a contender my personal favorite would be Viogner which I think is really coming on strong. Riesling put us on the wine map nearly 50 years ago...then got trashed because of all the "new" varieties", one-by-one being planted. Now it's back where it belongs! All you red wine only snobs need to get a life. I remember attending a wine conference years ago and speaking on an elevator with Peter Sichel (of Blue Nun fame...a wine that helped many of us transition to where we are now)and he told me that no other wines age like good Riesling. Having a cellar full, I concur. Riesling Rules in WA! I think that a lot of us would like it to by Syrah; but with so many less than stellar Syrahs being produced, to me, the overall picture of Washington Syrah isn't so good. Don't get me wrong, I really like a really good Syrah, but it doesn't get my vote. Other places are doing them better. Riesling shines in Washington, but we have the same problem with the range of quality. By volume alone it could the winner. But I'm voting Merlot. I think that it's a varietal that uniquely shines in the Washington terrior. It's big and bold here. Winery's like Northstar really turned around my opinion of the grape based on my previous experiences from California Merlots that are simply too soft and wimpy for me to enjoy as the primary varietal in a wine. It was tough for me to fall off of the fence, but in the end I voted for Merlot over Syrah. A couple of factors tipped me over. One was that while Syrah is showing great promise, it is still relatively new in WA. The second is that out side of BDX' Right Bank, I don't think anywhere else in the world can do Merlot as well as WA. WA Syrah still has major competiton from many regions and so I don't see as much regional identity for that grape when it is still associated with so many other regions. But it was a close decison for me. Folks, it appears that the Google Poll functionality is broken as we've lost more votes in the last 24 hours than Florida in 2000! I'll find another way to get a new poll set up using another system. Stay tuned. Washington’s geographical and winemaking diversity may preclude any single grape from being anointed as the signature of the state but my money, time and effort is riding on Cabernet Franc. Washington Franc achieves a richness, depth and complexity that is not attainable in its traditional homes of the Loire and St. Emilion, or places to which it has been transplanted like Bolgheri and Napa. This unique and world leading character sets it apart from all other varieties planted in our state, making it my candidate for our signature grape. Right now Merlot is close to being a signature grape because of the style they make here very distinct. I also feel that red blends have a great potential in this state, not a true varietal but can make a great wine. "Belle Isle" if you want to be historic. I've had Leonetti's Sangiovese the other day. I was deeply impressed, I think Sangiovese may have a bright future.